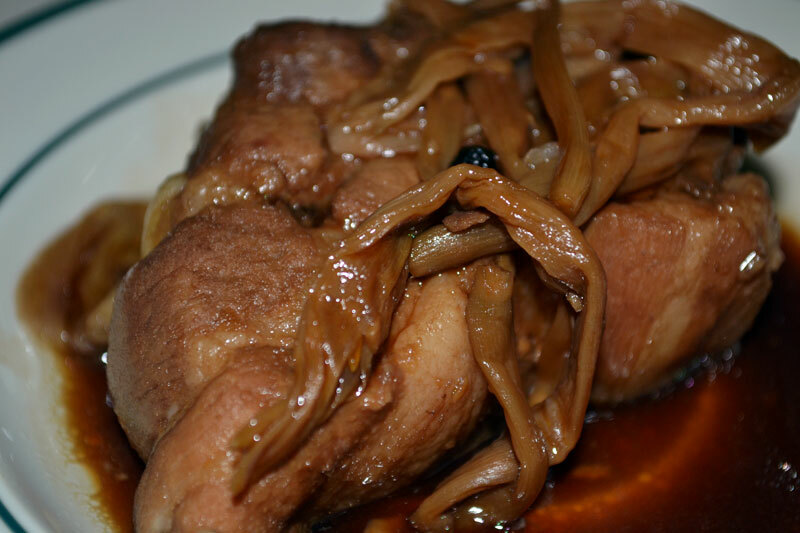 Cooking in vinegar is an age-old tradition in the Philippines. In the past, when refrigeration was virtually unheard of, cooking in vinegar was an effective way of preserving meat, fish, and veggies. The process is known as paksiw. But not only does it preserve the food, but it also makes a tasty meal which, like adobo, becomes richer the following day - if it can last that long! This recipe uses dried banana blossoms (because this is what we have from the Asian store). If buying the dried variety, give it a good wash before soaking in water to remove much of the salt content. Place the pork pieces in a thick-bottomed pot. 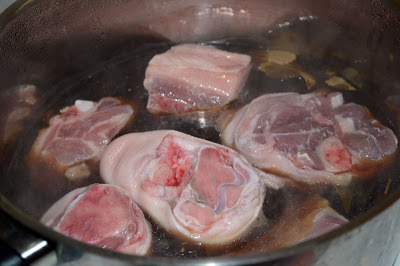 Add the soy sauce and vinegar, then add enough water to nearly submerge the pork pieces. Add in the rest of the ingredients, save for the banana blossoms. Do not mix, as it will affect the taste of the vinegar. Reduce heat (medium-low) to simmer for an hour. Check if the pork pieces are tender by piercing with a pork. If not yet tender, continue simmering for half an hour or less. Add the banana blossoms and cook for a further 5 minutes. Taste and adjust accordingly with salt if needed. kakagutom naman.. haha parang yan ang gusto kong iulam tomorrow. nice. delicioso!